NEW YORK, New York — The Hayastan All-Armenian Fund is implementing its third development project, the construction of a kindergarten, in Drakhtik, a village in Artsakh’s Hadrut Region. The initiative is co-sponsored by the Fund’s French affiliate and the government of Artsakh. Drakhtik’s old kindergarten, built in the Soviet era, was converted to a military post during the Artsakh War. No longer fit for use as an educational establishment, the building now serves as a community-administration center. Drakhtik’s close to 20 preschoolers currently attend classes in a single classroom temporarily made available at the community’s main school, which is not equipped to meet anything beyond the core educational needs of the nursery students. As for the community’s more than 15 kindergarten-age children, there is simply no kindergarten that they can attend. The situation will be reversed in time for the new academic year in September 2011, when construction of the new kindergarten, begun in August of last year, is slated to be completed. Currently, crews are building the second floor of the future campus, which is designed to accommodate up to 50 students. The building will have nap rooms and playrooms for nursery and kindergarten students as well as a gym and a music room. Equipped with the latest in air-conditioning, central-heating, and fire-safety systems, the campus will feature a complement of modern amenities including a kitchen, a cafeteria, a medical clinic, a laundry, and a sizeable playground. “I am confident that the ongoing improvement of the community’s living conditions will not only stem the tide of migration, but foster prosperity,” says Ara Vardanyan, executive director of the Hayastan All-Armenian Fund. 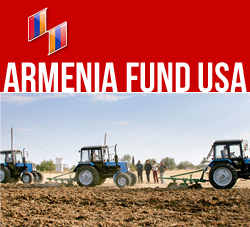 ABOUT ARMENIA FUND USA: founded in 1992, was one of the first of “Hayastan” All-Armenian Fund’s 20 international affiliates and serves constituents in all states east of the Mississippi. As a non-profit, non-governmental, nonsectarian organization, the Fund represents all Armenian constituents, supporting strategic infrastructure projects in Armenia and Karabakh. The Fund has adopted a policy to go “Beyond Bricks and Mortar” to provide sustainability for projects it sponsors.